Palestinian youth activist Daoud Ghoul was released again from Israeli occupation custody on Sunday, 11 December, but ordered to 10 days house imprisonment in his home in Silwan, Jerusalem, because he was received by a celebration held for him by the people of his town when he was released from Israeli prison after 18 months on 27 November. Ghoul, the director of youth programs for the Health Work Committees in Jerusalem, had been seized once more by Israeli forces one week after his release, on Monday, 5 December. Ghoul has been subject to a series of escalating repressive Israeli attacks since he returned to Palestine from Brussels, Belgium in November 2014 after speaking before the European Parliament about Israeli attacks on Palestinian life in Jerusalem. He was first ordered exiled from his home city of Jerusalem, then barred from the West Bank and international travel. The HWC office in Jerusalem was shut down by military order, and Ghoul was arrested, accused of affiliation with a banned political party, the leftist Popular Front for the Liberation of Palestine, and sentenced to 18 months in Israeli prison. Also today, former prisoner and hunger striker Munir Abu Sharar, released from administrative detention in April of this year and married just one week ago, was arrested in a night raid by Israeli occupation forces. However, Abu Sharar was released this afternoon after several hours’ detention and has returned to his home and family. Palestinian circus trainer and performer Mohammed Abu Sakha, 25, was once again ordered to six months in administrative detention, imprisonment without charge or trial, on Sunday, 11 December. Abu Sakha has now been imprisoned for a full year with no charge and no trial; his case has received widespread attention. He is a circus teacher and performer who works with Palestinian children with disabilities at the Palestinian Circus School. He has toured around Palestine and internationally as part of the circus. Abu Sakha was seized by Israeli occupation forces on 14 December 2015 at the Zaatara military checkpoint, as he attempted to cross while traveling from his home to his workplace in Bir Zeit. Abu Sakha has spent nearly 10 years participating in, performing in, and now working for the circus school, and was scheduled to participate in multiple international circus events at the time of his detention. Abu Sakha’s case has received widespread international attention, in part due to his own wide network of international friends and fellow circus performers. Events and actions in the United States, Canada, Uruguay, Chile, Germany, the UK, Belgium, France, Spain, Portugal and elsewhere have highlighted Abu Sakha’s detention without charge or trial. His case has drawn not only the attention of Palestine solidarity organizers but also of human rights organizations like Amnesty International and circus performers and arts organizations around the world. This marks the third consecutive administrative detention order against Abu Sakha. Administrative detention orders are issued for one to six months at a time and are indefinitely renewable; some Palestinians have spent years at a time held under administrative detention. There are currently 700 Palestinians held without charge or trial under administrative detention, out of 7,000 total Palestinian political prisoners. Currently, three Palestinians held under administrative detention are on hunger strike, including Ahmad Abu Fara and Anas Shadid, who have been refusing food for 79 days to demand their freedom from administrative detention. Both are in an extremely critical health condition in Assaf Harofeh hospital and have vowed to continue their strike for freedom. Another hearing on their case before the Israeli Supreme Court is scheduled to take place today, 11 December. Also on strike is Ammar Hmour, who has refused food for 20 days in protest of the renewal of his administrative detention and is held in solitary confinement in Ashkelon prison. President-elect Donald Trump is assembling a national security team dominated by retired generals who share a deep distrust of Iran and have characterized the threat of Iran in far more dire terms than Obama administration officials and intelligence assessments. Those experiences could lead retired Gens. Michael T. Flynn, James N. Mattis and John F. Kelly to urge caution in Trump administration debates about the use of force. But former colleagues and experts said the generals are also more likely, by virtue of their training and experience, to see malign intent or view the world as a struggle between good and evil. Statements and online postings by Flynn, Trump’s choice for national security adviser, have drawn the most alarm among intelligence analysts and the foreign-policy establishment. Mattis and Kelly — Trump’s respective nominees for secretary of defense and secretary of homeland security — have been far more measured in their foreign-policy pronouncements and are widely respected within the foreign-policy establishment and among the United States’ Gulf Arab allies. Yet each has expressed hard-line views about Iran and the threat of terrorism. “We’re going to have to plan for the worst,” Mattis said. “These terrorists can never directly destroy our way of life, but we can do it for them if we lose track of who we are and the values that this nation was founded upon,” the president said in a speech earlier this week. The three generals also share a widely held frustration in the military that they have been fighting for 15 years without the full support of the country or its civilian leaders. When Mattis retired from the Marines in 2013, he spent two weeks zigzagging across the country visiting the parents of Marines killed under his command. Kelly and his two sons have taken part in more than a dozen combat tours in Iraq and Afghanistan. When his son’s platoon was deployed to Afghanistan in 2010, he made weekly and sometimes daily trips to visit his son’s wounded Marines at Walter Reed National Military Medical Center in Bethesda, Md. Those trips continued after his son was killed in combat. Flynn, who served in Afghanistan and as the Joint Special Operations Command’s senior intelligence officer, has spent as much time deployed to war zones as almost any other general in the Army over the past 15 years. The disconnect between the generals and Washington also extended to the battlefield, where military officers often felt compelled to describe the messy wars to their troops as battles between good and evil. A big question is how the perspectives of senior military officers, serving in Cabinet-level positions, will influence the direction of a Trump administration. Obama’s deep skepticism of foreign intervention meant that he often served as a brake on discussions about how the United States might respond to hostile developments overseas. Trump has no foreign-policy or military experience to examine for insights into how he might respond, but his campaign posture was animated mainly by the promise of aggression. “I think it’s likely there will be terrorist attacks in the coming years, and I think Trump will feel tremendous pressure to be seen as acting very decisively,” said Dan Byman, a former Middle East analyst at the CIA and a professor at Georgetown University. Trump’s advisers may be quicker to see nefarious intent because of their military experience, he said, but be more cautious about U.S. military intervention or retaliation. Byman cited the example of the Iranian seizure of American sailors shortly before the Iran nuclear deal was signed as an example of an overseas provocation that had the potential to derail broader U.S. policy goals. BETHLEHEM (Ma’an) — On a chilly Monday afternoon, a group of four Israeli soldiers were stationed on the balcony of what is known to locals as the Cola building in Aida refugee camp’s cemetery, weapons pointed at a group of five Palestinian boys, none older than 11, who were peeking from around a street corner some 50 meters away.The scene has become a familiar one in the occupied West Bank refugee camp, as the Israeli army has escalated military procedures in Aida over the past several months, creating what some residents have called a perpetual “atmosphere of fear.”An ‘almost permanent’ army presenceAida, home to an estimated 5,500 Palestinians, is located in northern Bethlehem. 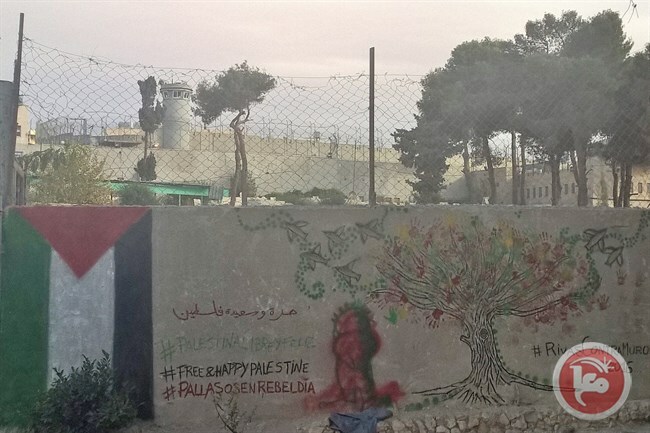 Adjacent to the camp lies Israel’s separation wall, which notably isolates Rachel’s Tomb from the Palestinian population, and an Israeli military base.The camp has a long history of demonstrations against Israel, including during the 2014 war on Gaza. However, locals told Ma’an that the Israeli army has been noticeably stepping up its use of violence and detentions in the past two or three months, despite there not being an increase in protests or other actions against the Israeli occupation.“Israeli forces in the last two months have secured most of the area,” Salah Ajarma, the general manager of the Lajee Center in Aida, told Ma’an. “They go down (into the camp) all the time, and we didn’t see that in our area before.”“(Army operations) have occurred in Aida ever since they established the (separation) wall, but lately within the last month or two, the provoking actions by soldiers have become very dangerous,” Nidal al-Azza, a resident of Aida and the director of NGO BADIL, told Ma’an. “This creates an atmosphere of fear among people.”Muhammad Abu Srour, a volunteer at the Aida Youth Center, told Ma’an that soldiers deploy in a number of key areas, mostly during the night. “But even during the daytime, they shoot tear gas, rubber-coated steel bullets, and sometimes live ammunition,” he said.Ajarma said he was worried about the increased use of weapons aimed at people and homes, stating that while few locals had been injured by live fire in past months, many had been hit by ostensibly less dangerous weapons, such as rubber-coated steel bullets, or affected by tear gas.The UN Office for the Coordination of Humanitarian Affairs (OCHA) told Ma’an it had records of Israeli forces injuring at least 43 Palestinians, including 14 children, in Aida between Sept. 1 and Nov. 28.While al-Azza confirmed that Israeli forces were using tear gas “every day,” he noted that the army’s use of floodlights in the camp also had a disruptive effect on the population.“Lights reach inside people’s homes at night — it feels like it’s daytime,” he said. “You feel like they are sitting with you in your home. It’s not just fear, you feel uncomfortable, like someone is watching you.”UNRWA spokesman Chris Gunness told Ma’an that the United Nations agency, which provides services to Palestinian refugees, was “worried” about the increase in the Israeli army’s use of live ammunition, noting that it had recorded an increase in injuries and deaths caused by live fire in and around Palestinian refugee camps in 2016.“UNRWA continues to raise this concern, as well as the profligate use of tear gas, in the densely populated Aida camp, with the relevant authorities,” Gunness added. 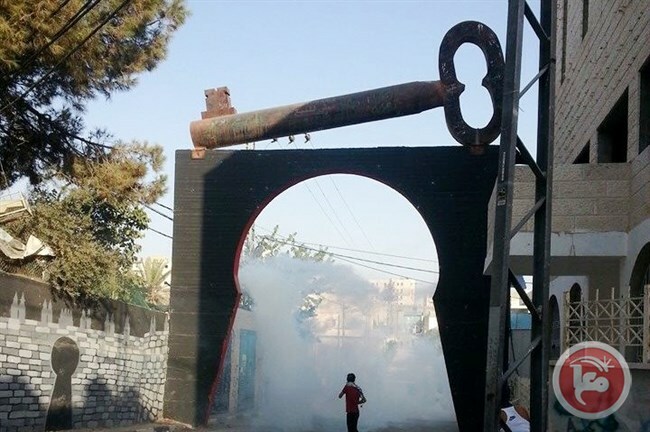 “The potential impact of the large-scale use of tear gas on the health of UNRWA staff and the camp population, particularly on vulnerable persons including pregnant women, the elderly, and children, is troubling.”Gunness also stated that ammunition fired by Israeli troops had landed in UNRWA’s school and office in Aida “on numerous occasions.”Children becoming targetsWhat has most alarmed Aida’s population, however, is the army’s increased targeting of minors, as more and more young Palestinians from the camp have been detained, some as young as 12.“Six months ago approximately, the army started arresting 16- and 17-year-old boys. Three months ago, they started arresting young children,” Abu Srour recalled. “They used to arrest one or two children every two weeks or so, but recently they started arresting more children in a shorter period of time.”In October, undercover Israeli forces disguised as tourists beat and detained eight minors who were gathered near the Key — the landmark gate in Aida located close to the Israeli army base.“I was at my window when the undercover forces came out and started beating one child. I thought it was a parent who didn’t want their child to be in the neighborhood because it’s dangerous,” Umm Muhammad, a resident of the area, recalled. “But then they started catching other children, beating two, then three. After that, (uniformed) soldiers came out of the military base very quickly.”Umm Muhammad only found out later that her 16-year-old son Muhammad and her 14-year-old nephew with special needs, Adam, had been detained in the raid. “We never expected this could happen to us,” she said.“Soldiers came dressed in civilian clothes from three different directions,” Abu Srour, who witnessed the incident, said. “The kids weren’t protesting or doing anything, just sitting there. The soldiers came and started beating them, throwing them against the wall, and arrested them.”Umm Muhammad said she was able to visit her son in prison for the first time on Dec. 4, nearly two months after he was detained, adding that he was doing okay, but that prison staff had rejected his request to be given glasses to address his poor eyesight.According to Muhammad’s father, the teen risks being sentenced to eight to ten months in prison and a 2,000-shekel ($525) fine for throwing stones.Abu Srour estimated that between 30 and 35 Aida youths between the ages of 12 and 17 were imprisoned by Israel as of the end of November.OCHA, meanwhile, told Ma’an that at least 35 Palestinians had been detained in Aida between Sept. 1 and Nov. 28. BETHLEHEM (Ma’an) — Palestinian security forces reportedly blocked Israeli troops as they attempted to enter the city of Jenin in the northern occupied West Bank on Sunday, and succeeded in forcing them to leave.A video that went viral on Facebook purported to show Palestinian officers standing in front of Israeli military vehicles attempting to drive into Jenin. The footage also shows Palestinian officers shouting and cocking their guns, before Israeli soldiers eventually retreated. The so-called “Islamic State of Iraq and Syria” (ISIS) have captured the ancient city of Palmyra (Tadmor) in the eastern part of Homs province after main contingent of the Syrian Arab Army (SAA) withdrew from the city. The aforementioned terror group claimed this through its media affiliate, ‘Amaq agency’. A bit late, military sources speaking to Al-Masdar News confirmed this information. The militants consequently captured Al-Amariyah district and a hilltop of the same name, Officers Housing complex, and the Citadel of Palmyra, which made any further attempts to hold positions inside the city completely senseless. According to several reports, some SAA units still remain in the city providing cover to their comrades that retreat westwards. After retreat is complete these units will withdraw as well. University of Manchester’s student union adopted BDS motions on Thursday as activists seek to pressure university administrators to withdraw investments from Israeli companies. A British university’s student union adopted BDS motions on Thursday following student activists’ calls that sought to pressure university administrators to withdraw investments from Israeli companies involved in human rights abuses. The congress of the University of Manchester’s student union – which claims to be one of the largest student union bodies in the UK – approved the BDS movement’s calls for boycott, divestment and sanctions from Israeli companies to pressure Israel to comply with international law. Student activists called for the university to divest millions of pounds in Israeli-linked companies and to cut ties with Israel’s Technion – State of Technology Institution over involvement in the development of hi-tech weaponry for Israel’s military. President of Recognise Refugee Rights Society Huda Ammori – who proposed the motion – said this was a symbolic step for the movement. 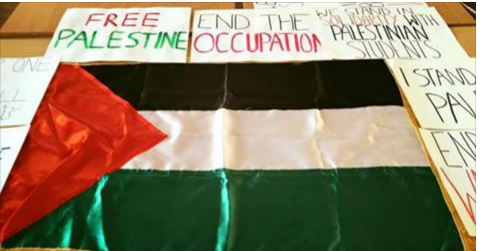 “We believe this is a large symbolic step in the BDS movement and we are asking for students from institutions all over the UK and internationally to campaign for BDS,” Ammori told The New Arab. Manchester University’s BDS campaign said it discovered the university holds just under £15 million worth of investments in companies “that facilitate and are involved in the atrocious war crimes being committed by the state of Israel”. With the student union now endorsing BDS, “we will pursue to campaign for full divestment and an end to all financial and institutional links with Israel’s war crimes”, Ammori said. Critics of the BDS campaign claim that the movement unfairly focuses on Israeli organisations, overlooking companies linked to other military abuses around the world. Ammori argues that is because Israel is “the longest modern day military occupation” which the international community has failed to end. “Palestine has been under occupation for nearly seven decades,” Ammori told The New Arab, “The international court committee has failed to bring justice to Israel’s continuous war crimes, illegal settlements and human rights abuses. Ammori also asserted that the BDS movement targets the Israeli government and not individual groups. The U.S. military said Thursday that it intentionally bombed a hospital in Mosul, Iraq as part of its efforts to “eradicate” Islamic State (ISIS) fighters. The attack on the Al Salam hospital complex took place Wednesday at the request of Iraqi forces, with coalition aircraft using “precision-guided munitions,” Air Force Col. John Dorrian, spokesperson for the U.S.-led coalition against ISIS, told reporters. He said “it’s very difficult to ascertain with full and total fidelity” that there were no civilian casualties, whether in the building targeted or elsewhere within the hospital complex. ISIS fighters, Dorrian said, “were using the facility to fire heavy machine guns and rocket-propelled grenades at the Iraqi security forces in the area.” The strike on the “normally protected facility” allowed the Iraqi forces “to fall back to a more defensible position,” he said. The military is not carrying out an investigation but rather an “assessment” of the strike, the spokesperson added. The battle to reclaim Mosul from ISIS fighters, which began in October, has left civilians, including roughly600,000 children, trapped and facing a worsening humanitarian situation. Ramallah – The seventh Congress of Fatah which concluded this week was highly important for Mahmoud Abbas, it represented a multi-front battle and a fruitful investment for him. However, most importantly, this congress has established for a new phase that will draw the new president’s features and provide a flexible transfer of authority. The transfer follows many dues: Fatah’s elections that brought a new central committee, elections and PLO elections to choose a new executive committee. According to the Fatahawi concept, the coming president must be a member in the central committee and an executive member in the PLO. Abu Mazen’s assistants in Fatah recognized years ago the importance of appointing a vice-president for fear of a possible chaos provoked by exterior parties to eliminate Abbas from the scene without a prior notice. This fact was expected to open the door for many internal disputes and political conflicts with Israel, Arab countries, and the United States concerning the figure that should be chosen. However, despite that Fatah’s officials were aware of these dangers and urged to elect a vice president, Abbas didn’t feel rush to do so; rather, he sought to organize elections for both Fatah and the PLO. For years, no one dared to seriously discuss the appointment of a vice president for many political and personal considerations. Before the convention of the current Fatah Congress, Asharq Al-Awsat reported -according to an official in the movement- that by holding the 7th congress, the president sought to organize the interior ranks and to choose the president and his vice president, members of the central committee, and the revolutionary council. This process set to be followed by the convention of the Palestinian National Council to choose a new executive committee and to discuss the position of the vice-president; such decision requires many amendments in the basic law to be carried by the legislative council; however, given that the council has been disabled, the case should be referred to the central council. However, this scenario is expected to be severely opposed by Hamas; Naif al-Rajoub, MP for Hamas said that according to the Palestinian law, Aziz Duwaik, speaker of the Palestinian Legislative Council is the one who should succeed Abbas for 60 days till electing the new president. However, Fatah considers that Dwaik is an illegitimate speaker because he finished his mandate; this legal dispute has been a part of other bigger conflicts between Fatah and Hamas that prevented the implementation of general elections. Regional interferences have pressured on Abbas to hold reconciliation with his enemy Mohammad Dahlan. The Arab view stressed on the importance of holding an interior Fatah reconciliation that aims at empowering Fatah, followed by another reconciliation with Hamas, to finally achieve the long awaited general elections to eliminate division. This view, which seems fairly acceptable, has remarkably pissed off Abbas who has completely refused any connections with Dahlan, which pushed him to organize these elections to exclude him – once and for all – by appointing a new president and a vice president. An official in Fatah said that the movement has denounced the Arab intervention and didn’t expect such pressures; the official asserted that the Dahlan matter is behind them and any reconciliation with him is totally rejected. Observers see that the selection on a vice-president for Fatah and a secretary general for the PLO will play a major role in determining the person who will succeed Abu Mazen. During the congress, Fatahawis voted for the Captive in Israeli prisons Marwan Barghouti to head the new central committee after he received 930 out of 1100 voices. In an important step, Abbas expressed his contentment from Barghouti’s winning in a phone call with the captive’s wife to inform her about the results. Supporters of Marwan al-Barghouti known as the “Mandela of Palestine” see that he will be the best successor for Abbas; it is worth noting that Barghouti confronted Abbas in the elections of 2005, but withdrew under heavy pressures and warnings from interior conflicts in Fatah. The captive suggests that his election as Abbas’s deputy will oblige Israel on releasing him. However, some Fathawi officials see that Barghouti’s appointment from his prison is impossible. It’s true that Abbas made important steps in regulating the interior ranks of Fatah to secure a flexible transfer of authority far from his enemies and their supporters, but the political analyst Tala Awkal sees that the matter cannot be controlled by Abbas alone. He also said that the decision cannot be only taken by Palestinians; the concerns of their Arab partners and the Israeli control also play major role. However Awkal saw that in Fatah Congress, Abbas delivered a significant message for his enemies saying that he will lead his ship till the end and that the new leader will be chosen by him. Al-Qassam Brigades, the armed wing of Hamas, has renewed its vow to continue working tirelessly above and below ground to prepare for the battle of liberation from the occupation. This came during a memorial ceremony held in Gaza City for two of al-Qassam fighters, Ismail Shammali and Rami al-Arir, who recently died in a tunnel collapse incident. In a speech, a spokesman for the Brigades affirmed that al-Qassam Brigades found no choice but to continue its training and preparation efforts in order to defend its people. The spokesman hailed all the martyrs who died on the path of preparation and training as a “badge of honor for the Brigades and the Palestinian people,” calling for honoring them by rallying around their goal which they sacrificed their lives for. “Those fighters are moving forward without rest or retreat, digging beneath earth and preparing above it, and their arms will not stop moving until they achieve the goal of al-Qassam Brigades and liberate Palestine,” Masri stated in a speech during the ceremony.